But you didn't find just any old house painter. Mars Painting has been proudly painting homes in Waukegan, Illinois since 1992. Painting the exterior of your Waukegan house protects it from the elements, helps retain home value, and makes it presentable. Interior painting can brighten walls and ceilings and lift one's spirits. When looking for affordable high quality house painting Waukegan home owners can count on, no one beats Mars Painting's experienced painters. 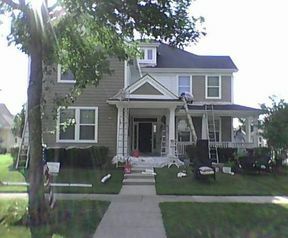 If you have ever tried painting your Waukegan home, you know that its not an easy task. Painting houses is both a skill and an art. That's why Mars Painting's professional house painters must have several years of experience painting houses in and around Waukegan, Illinois and be familiar with Waukegan's various residential architectural styles and building materials used in house construction over the years. 5★★★★★ - "Best paint job I've ever seen. Mario & his men are without a doubt the best." 5★★★★★ - "Mario and his team did a great job on our entire exterior project and some interior. He is very quick and attentive. Price is reasonable too." 5★★★★★ - "Mario and his crew are the best! They did an outstanding job on our home and kept a very strict deadline we had to move into our home. They transformed our home from 1988 to 2014!! They are timely, dependable and reliable. I highly recommend them!" 5★★★★★ - "I used Mars Painting to repaint the interior of my house. They are very professional, well within budget, get things done on time and are very professional. They did an amazing job and are very clean, and do not leave the house in a mess after they are done for the day. I used them again for the water damage I had due to the bad winter. They delivered as promised. They will paint the exterior of my house this summer for sure. I don’t have to look for any other painter. Now when I need a paint job, I call Mario." 5★★★★★ - "Mario and his entire crew did a beautiful job on the exterior of our home. They turned old dated bricks new again! The attention to detail was amazing and everyone was so professional and friendly. Mario quoted us a fair price lower than other companies in the area. We highly recommend them and look forward to using them for all our future painting needs!" 5★★★★★ - "I asked Mario to quote removing the "popcorn" ceiling from our living room and to paint the interior of the rest of our home. He arrived exactly on time and gave me an estimate on the spot. In the end we hired him only to do the ceiling work (we decided to do the painting ourselves). Mario and his crew did an amazing job. Again they arrived on time, were very respectful of our home and cleaned up thoroughly when they were finished. We are so happy with the end result that we have decided to go ahead and hire them to do the interior painting after all. Looking forward to working with him again. I would (and have) recommend him to anyone." 5★★★★★ - "Mario and his team are fantastic. They took such care with our long neglected wood siding and made it beautiful. Clean and courteous and Mario is always available. Will definitely use on future projects." 5★★★★★ - "Customer satisfaction is Mario's No.1 priority. We were very satisfied and he has reasonable prices." 5★★★★★ - "Mario and crew exceeded our expectations. Beautiful & detailed painting every inch of our interior home. Fantastic communication and a complete pleasure to work with." !! !Thanks for all your help! My house looks amazing because of you!!" 5★★★★★ - "Outstanding. Punctual. Courteous. Totally professional. I highly recommend Mario and his excellent crew!" 5★★★★★ - "Mario and his staff did an outstanding job on a tricky and complex ceiling job. On time and professional quality from start to finish, great communication and pricing. I will definitely call Mars for my future painting needs." 5★★★★★ - "We would highly recommend Mars Painting for many reasons. Mario and his team exceeded our expectations from the start of our project. We were impressed with the crew's professionalism and attention to detail. Their work was precise and clean, and we are extremely happy with the finished product."